Plugin for TC for view MS Access database files (*.mdb, *.accdb). 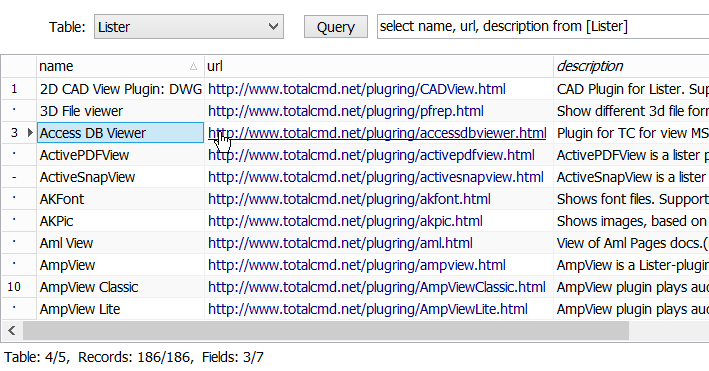 Replacement for Access Viewer (http://totalcmd.net/plugring/mdb.html) but for view data. 64-bit version need installed Microsoft Access Database Engine 2010 Redistributable (https://www.microsoft.com/en-us/download/details.aspx?id=13255) or Microsoft Access Database Engine 2016 Redistributable (https://www.microsoft.com/en-us/download/details.aspx?id=54920). 32-bit plugin version depends of Windows version and installed (or not) MS Office version. Ver 1.3.2 Beta: * bug fixes. Ver 1.3.1 Beta: + export to rtf and html (text/numeric values only); * some fixes. Ver 1.3 Beta: + simple table export to sqlite3 format table; + AccessDBViewer.ini for manual setup: [AccessDBViewer] ShowPasswordDialog=0 - ask password if can't open database; ShowTablesPanel=0 - on/off tables panel; * other fixes. Ver 1.2 Beta: * now simple query from base possible; + search panel (Ctrl-Shift-F); * some fixes. Ver 1.1 Beta: + export to xlsx (text/numeric values only); * some fixes. Ver 1.0 Beta: * public release.